Americana Brown was eventually sold as part of the Early American collection, although it did not start out that way. The 401 and 404 bowls were combined to create a Chip n’ Dip set. In 1966, Corning Glass Works released an earth-toned 400 series mixing bowl set originally known as the Multicolor Bowl set. Each of the four bowls had a solid color and a white rim, similar to the Multitone Blue Mixing Bowl set released in the same year. The four-piece set retailed for $4.50 in 1966. The 1 ½ pint bowl (401) is golden yellow. The 1 ½ quart bowl (402) is olive green. 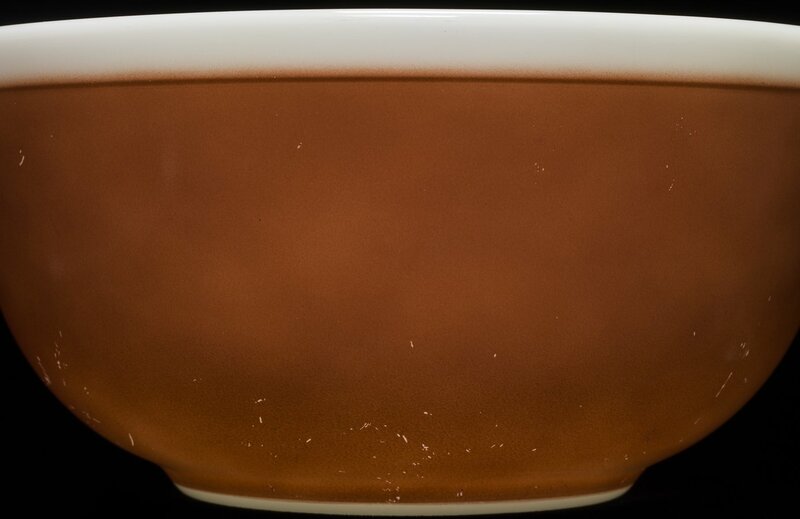 The 2 ½ quart bowl (403) is a burnt orange color and the four-quart bowl (404) is brown. Along with the Mixing Bowl Set, the 401 and 404 bowls were sold as a Chip n’ Dip set with a metal bracket. The Early American collection continued for two more years after the Americana Brown Mixing Bowl set was discontinued in 1969.